Ahhh It's Fall, one of my favorite times of the year. Driving thru the New England countryside, marveling at the beautiful shades of yellow, green, red and orange. With a brilliant blue sky overhead as a backdrop, I step from my car and feel a slight chill in the air. The aroma of meats being grilled over thousands of tiny BBQ's positioned precariously close to the gas tanks of tens of thousands of cars parked in the stadium lot fills my nostrils. I can hear the rustling of leaves in the wind, the footsteps of my fellow photographers running up and down the sidelines, the distinctive "snap" of a monopod stud breaking off, the thump, of a telephoto lens as it bounces off the ground, and the bloodcurdling scream of it's owner. Learn how to carry the lens the "right" way! 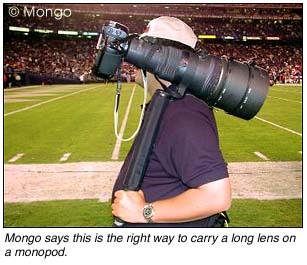 When you carry the lens in this position, (hands up) with the monopod resting on your shoulder, the ENTIRE weight of the lens is carried by that little tiny _ inch x 20 monopod stud. Factor in your running, and bouncing up and down, creating inertial, shear and bending forces, you'll eventually exceed the beam strength and snap off the lens! If you just bring your hands down to your sides, the weight of the lens sits on your shoulder, and takes the strain off the monopod stud. If you use a Gitzo monopod, you'll find that it has a reversible threaded mounting stud that's thin (1/4 x 20) on one end and thicker (3/8 x 16) on the other end. You can minimize the chances of breaking the lens off, by using the thicker 3/8 x 16 (sometimes referred to as the European thread) section INSTEAD of the _ x 20. 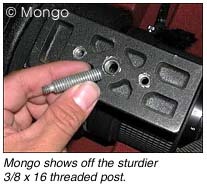 Depending on the vintage of your lens, you may have both _ x 20 and 3/8 x 16 threaded mounts. Always opt for the larger 3/8 x 16 if you have a choice. Most new lenses only have the _ x 20 mounts, BUT you can have them drilled out, tapped and threaded for the 3/8 x 16 helical by any good machine shop. Lest you think that this is an awful lot of work for what is perceived as a minor threat, let me give you a dose of financial reality. The average price of 400mm f2.8 lens is $8250.00! vs. $25.00 for a tap and die job.